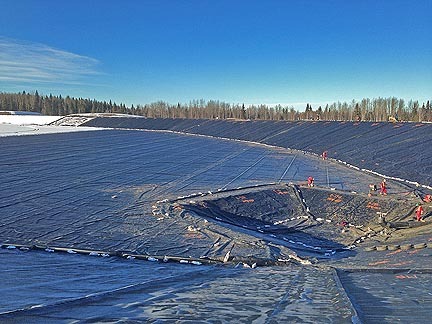 HeatGardTM HDPE geomembranes are the next generation in high temperature resistant geomembrane materials. HeatGardTM HDPE geomembranes utilize a new type of polyethylene that is uniquely resistant to higher temperatures and chlorine. The new HeatGardTM HDPE has been tested to be able to withstand continuous use at 85 C [185 F] for over 20 years. Typical HDPE geomembrane materials are not normally suitable for extended periods above 60C [140 F]. HeatGardTM HDPE has excellent chlorine resistance, chemical resistance, is fully stabilized against UV light exposure, and has excellent stress cracking resistance. Superior chlorine resistance is imperative in the highly oxidative environments of water and wastewater treatment facilities. HeatGardTM HDPE has been subjected to over a year of exposure testing to confirm its high temperature properties. HeatGardTM HDPE is available in wide rolls of smooth sheeting for field installation.